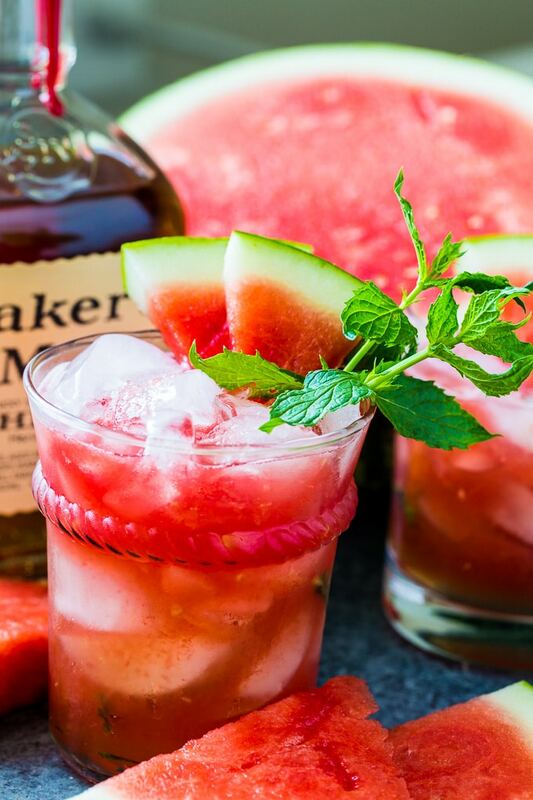 Watermelon Mint Julep is a delicious blend of fresh watermelon, mint, and bourbon. It makes a refreshingly sweet summer cocktail and is the perfect way to get your weekend started. 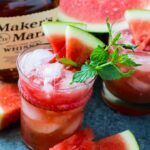 There’s nothing more refreshing than watermelon and this Watermelon Mint Julep has plenty of watermelon flavor. To make Watermelon Mint Juleps, first make a mint infused simple syrup. This can be made a few days ahead of time and refrigerated. Let the simple syrup cool and then mix with watermelon that has been processed in a blender until smooth and bourbon. Pour into glasses filled with ice and top the glasses off with a little club soda. The club soda adds a few bubbles and makes these Watermelon Mint Juleps even more refreshing. 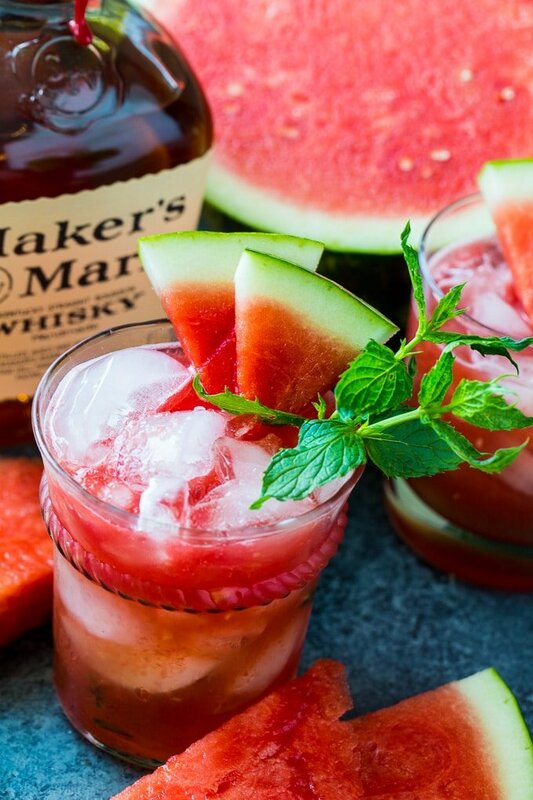 Garnish with some fresh mint leaves and a fresh slice of watermelon. For bourbon, Maker’s Mark is my go to, but there are so many good ones available. I also like Knob Creek and Four Roses. Combine sugar and water in a small saucepan. Tear mint leaves into pieces and add to saucepan. Set over medium-high heat. Bring to a simmer. Stir to dissolve the sugar. Remove from heat and let sit 20 minutes. To make 1 cocktail, combine 1 ounce mint simple syrup, bourbon, and 2 ounces watermelon juice and shake or stir. Pour into a glass filled with crushed ice. Add club soda. Garnish with mint and watermelon. 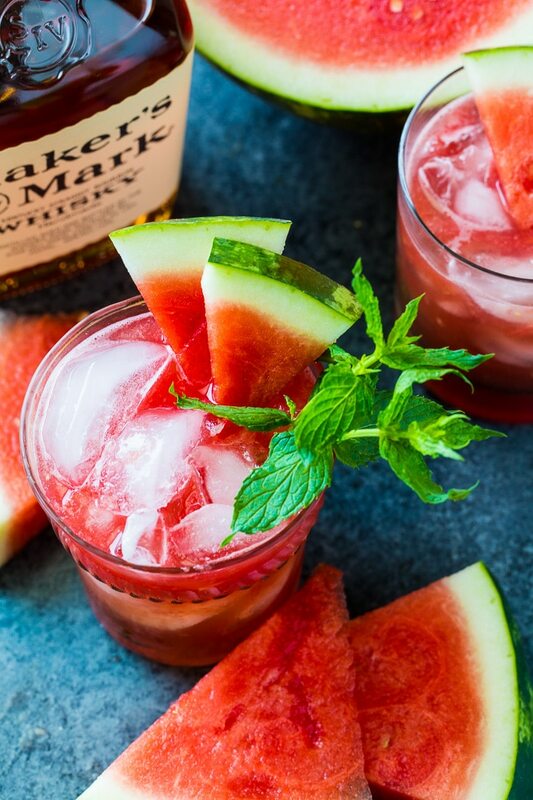 This entry was posted in Cocktails and tagged bourbon, watermelon. Bookmark the permalink.